There are about 30 species in this genus. 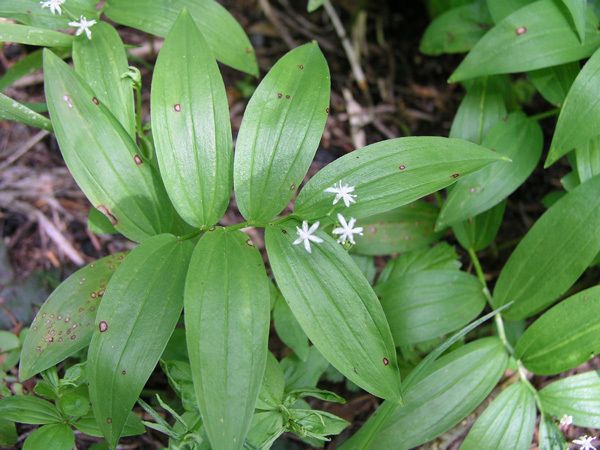 Star Solomon's-seal is a common plant occuring widely over much of North America and Canada. It ranges from Alaska to California; northern British Columbia to the southern Rocky Mountain states of Colorado, Nevada, and Arizona; east to the New England states, and south through the Carolinas. 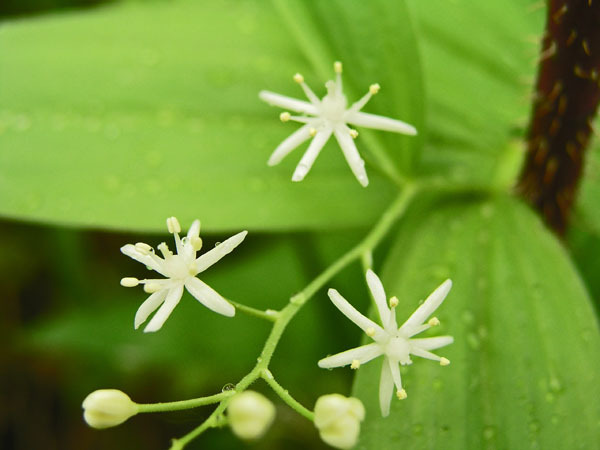 The flowers on the plant are small but bright and appealing looking, while the foliage is broad in a pleasing symmetry. Very pleasant to the eyes. It is native to North America, Central America, and Europe. 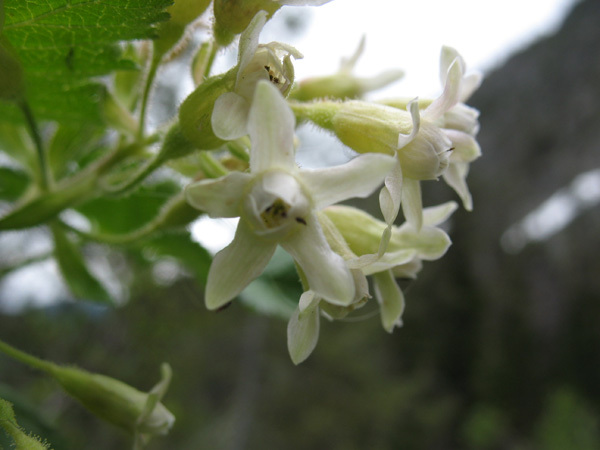 In British Colunbia the Nuxalk Indians collected the ripe berries from starry Solomon's-seal from July to August for food. The rhizome sampling of the plant have revealed high concentrations of manganese, iron, and zinc but we have heard of no specific cultivation of the plants for the purpose of extracting these substances. 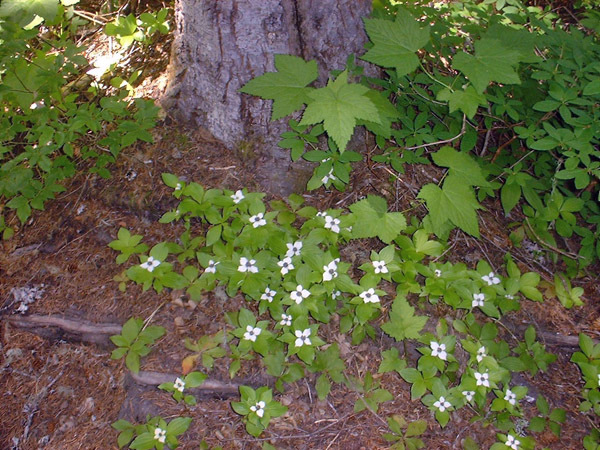 Quote from the USDA Forest Service Database: "IMPORTANCE TO LIVESTOCK AND WILDLIFE : Starry Solomon's-seal fruits and leaves are eaten by grizzly bears foraging in avalanche chutes and stream bottoms in northern Montana and southern British Columbia. In northern Idaho, elk consume the leaves of starry Solomon's-seal in summer, and ruffed grouse eat the berries in the fall." End quote. Plant location: The plants in these panels were sighted in two locations; Ingalls Creek in Washington on May 19, 2007 and Larch Mountain in Oregon on July 1, 2007. Bloom season: Blooming begins in May and June, with our latest viewing in July. There are only 12 species in this genus, and 2 varieties: porteri and brevilobum. 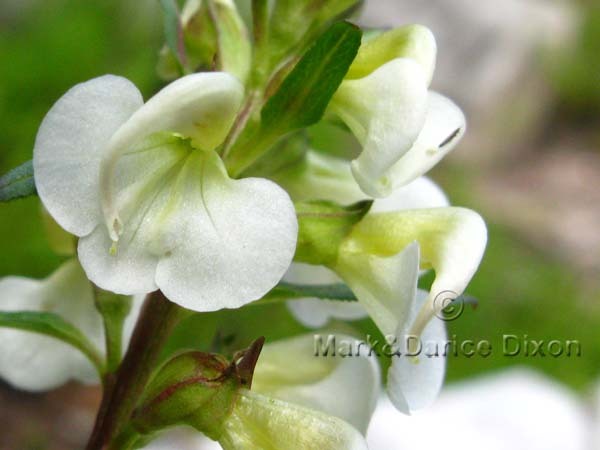 The species is a perennial herb used for its medicinal properties. Osha grows in parts of the Rocky Mountains, especially in the North American Southwest. 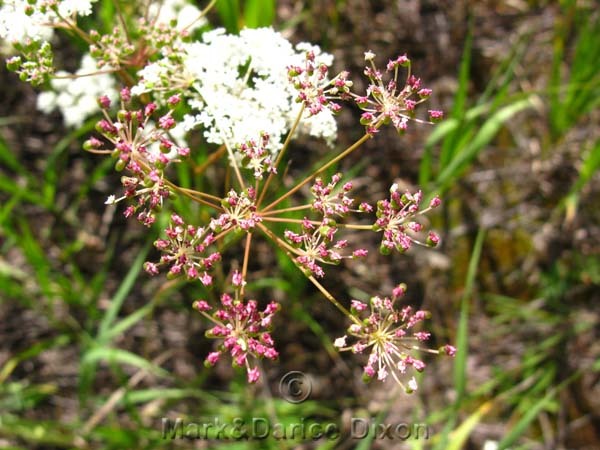 The flowers of this species can also be pink with the plants sometimes mistaken for stunted Cow Parsnip. USES: Some records of Native American tribes using this species: Zuni Drug (Antirheumatic (External) Infusion of root used for body aches. (Ceremonial Medicine) Root chewed by medicine man and patient during curing ceremonies for various illnesses. (Throat Aid) Crushed root and water used as wash and taken for sore throat. Apache, Chiricahua & Mescalero Eaten without preparation or cooked with green chile and meat or animal bones. Yuki (Protection) Roots used to ward off rattlesnakes. 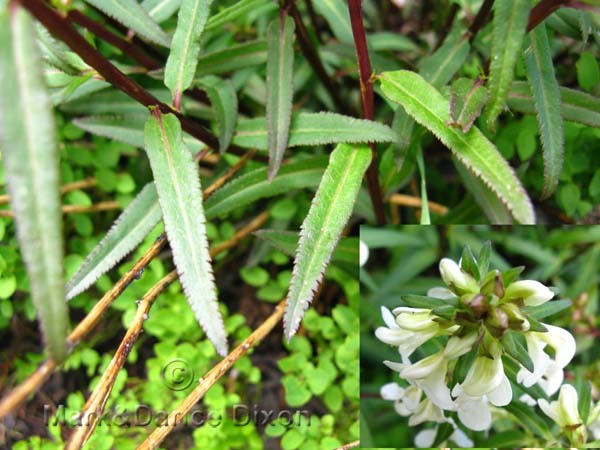 PER Plants For a Future: The roots, seed and essential oil (obtained from the roots and the seed) of this plant are a bitter, camphoraceous warming herb that stimulates the circulation, kidneys and uterus. They are also antirheumatic, antispasmodic, diaphoretic, digestive, expectorant, febrifuge and stomachic. They are used internally in the treatment of eruptive fevers, bronchial infections, digestive complaints, toothache, painful menstruation and retained placenta. They have also been used to treat TB. and headaches. An infusion of the roots is used externally to treat body aches. The root is harvested in the autumn and can be used fresh or dried. FunFacts: Osha is the word for "bear root" in a Native American language (Ute) and osha is referred to as "Bear Medicine" since the plants are eaten by bears for what appear to be medicinal purposes. Native Americans often observed that bears would seek out stands of osha and consume the plants roots directly after emerging from winter hibernation or when wounded or sick. WIKIPEDIA: Osha roots have a collar of dead leaf material surrounding the root crowns which is hairlike in appearance. The roots dry very quickly and are very astringent when fresh, and can cause blistering of the mouth and mucous membranes in humans if ingested fresh. The dried roots do not have this astringent affect. Roots of older plants are far stronger and bitterer than those of younger plants. Native Americans typically harvest the younger plants for medicinal use. 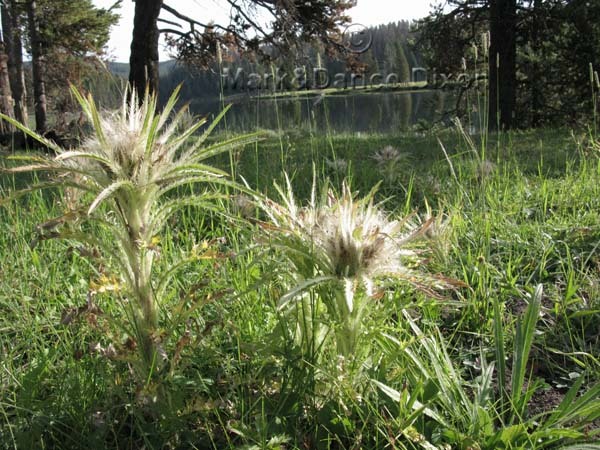 Plant location: We saw this specimen in the Medicine Bow National Forest. The date was July 22, 2009. Found in the following states: AZ, CO, MT, NM, NV, UT, WY. Strictly a mountain plant, it is most commonly found in deep, moist soils rich in organic material, per WIKIPEDIA. Bloom season: Unknown. 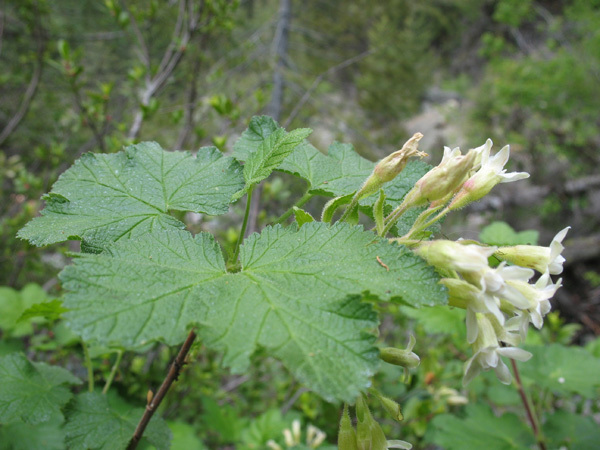 Sticky currant is one of 150 species in the genus Ribes. This plant is distributed widely in the west and is a native of the Northern Hemisphere in temperate regions. The common name probably derives from the presence of glands that secrete a thick gummy substance. The plant produces black berries with a blue wax finish that are also extremely gummy. Unfortunately this lovely plant carries a tainted reputation. Efforts are made in many states even to eradicate the plant. It is one of two hosts of the plant disease White Pine Blister Rust. 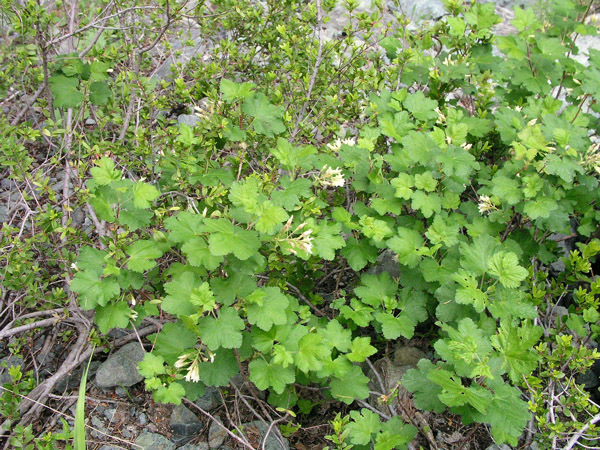 This information comes from WIKIPEDIA: 'Another form of control practiced in some areas is to diligently remove Ribes plants from any area near white pines. Because the infection moves from currant plants, to pines, and back again, it cannot continue to exist without its alternate host. Although effective in theory, removal of currants is rarely successful in practice, as they readily re-grow from small pieces of root left in the soil, and the seeds are very widely spread in birds' droppings.' A tenacious plant. USES: Native American Ethnobotany has the following record of use by the Montana Indian tribe: Fruit highly esteemed as an article of diet. Plant location: Sighted on June 17, 2007 on a hike in Esmerelda Basin, Washington state. It is found in the following United States: AZ, CA, CO, ID, MT, NV, OR, UT, WA, WY. 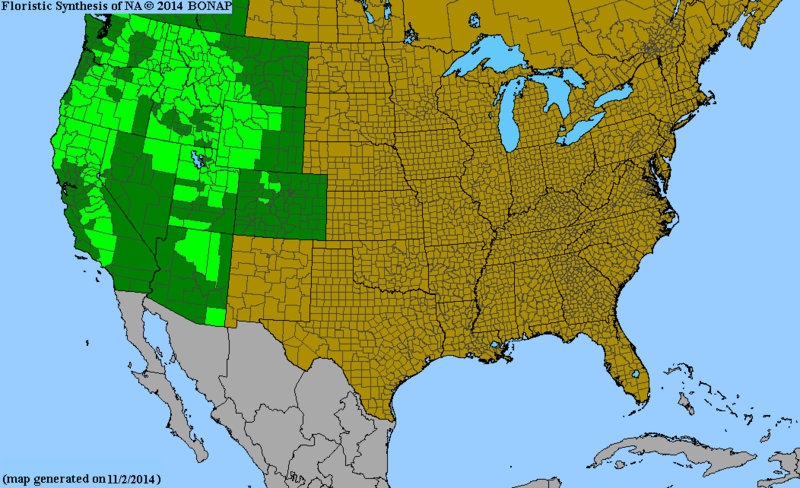 See the BONAP distribution map, here. Bloom season: an early summer blooming perennial. 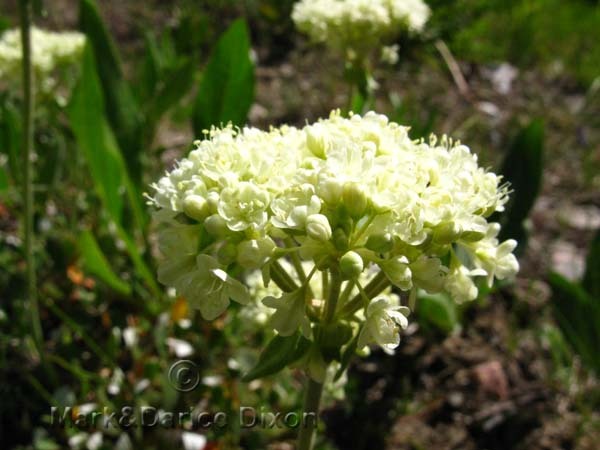 This species is similiar to the species umbellatum, actually is a variety of the same species. Often it is shown in it's dried state. It tends to color very attractively as it ages. 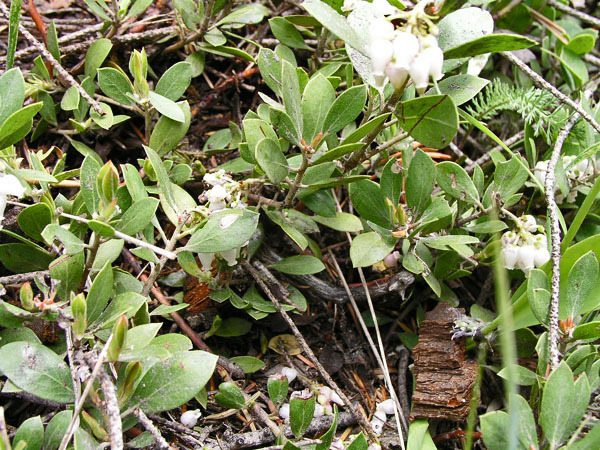 Plant location: Again, this is a specimen from Medicine Bow National Forest, Wyoming. We had passed through Centennial, headed up into the park proper on July 21, 2009, when we saw these lovely plants on the left side of the road at the base of an embankment. Same location as the Taper-leaved Penstemon. See it on page 4 of the Blue/Purples. Bloom season: June to September. These delicate white globes resemble Salal and White Mountain Heather. The differences are subtle, look for a covering of white-ish hairs on the stems of the plant. The flowers can also be pink. Here is what WIKIPEDIA has on the genus: 'There are about 60 species of manzanita, ranging from ground-hugging coastal and mountain species to small trees up to 6 m tall. Most are evergreen (one species deciduous), with small oval leaves 1-7 cm long, arranged spirally on the stems. 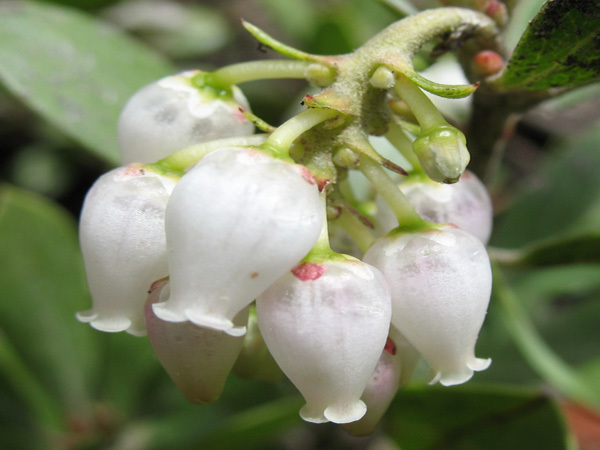 The flowers are bell-shaped, white or pale pink, and borne in small clusters of 2-20 together; flowering is in the spring. The fruit are small berries, ripening in the summer or autumn. The berries of some species are edible.' End quote. 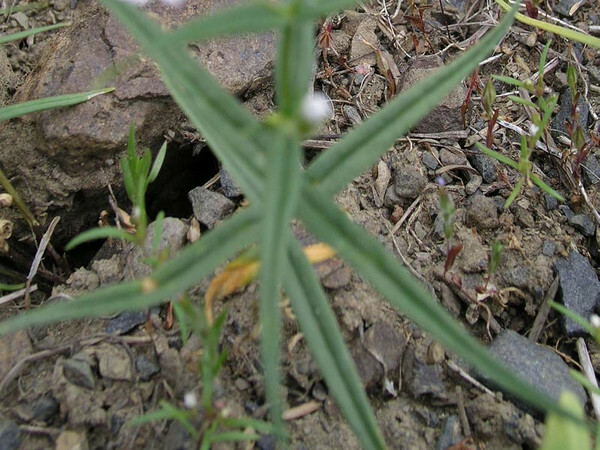 Plant location: Sighted on June 17, 2007 on a hike in Esmerelda Basin, Washington state. Bloom season: All through spring and, for us, early summer. It is a perennial. A smaller group of species in the carrot family, the genus Perideridia hosts 13 members. They are native to western North America. Per WIKIPEDIA is this: 'The plants have a unique appearance for members of the parsley family, and are tall (1-3 feet) and grasslike, with threadlike leaves 1-6 inches long that resemble blades of grass. 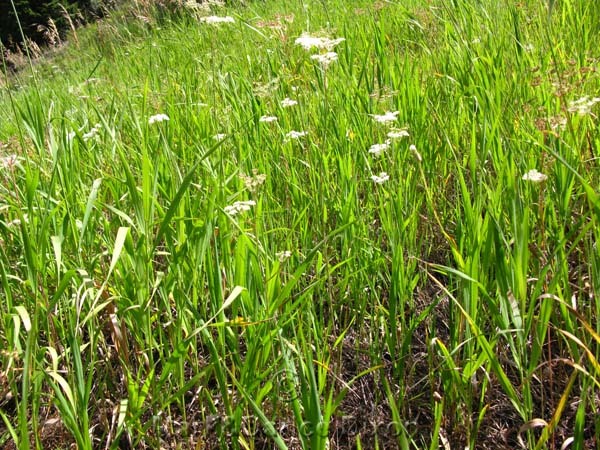 The plants effectively mimic tall grass and are virtually invisible until they flower, since they tend to grow in grassy meadows, and prefer full sunlight. 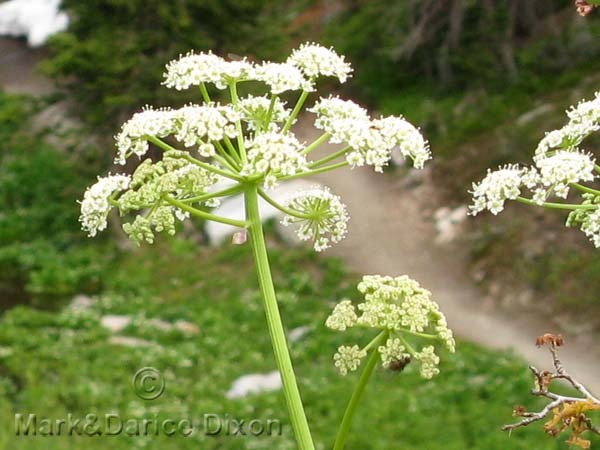 Like most members of the parsley family, Yampa produces umbels of white flowers. The small roots of Yampa are about the size of a large unshelled peanut. 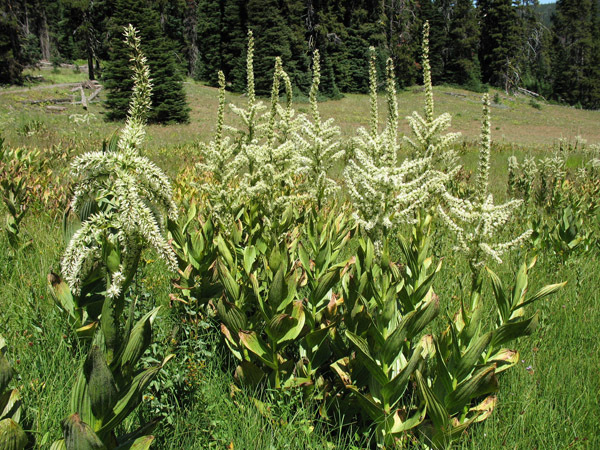 The plants are widely distributed in moist open meadows and hillsides up to 7,500 feet across Western North America and Northern Mexico.' End quote. Plant location: Seen on the beautiful Beartooh Highway (Wyoming side) near Yellowstone National Park. GPS coordinates: N44? 55.751 W109? 42.152. September 1, 2009. Elevation 7461'. 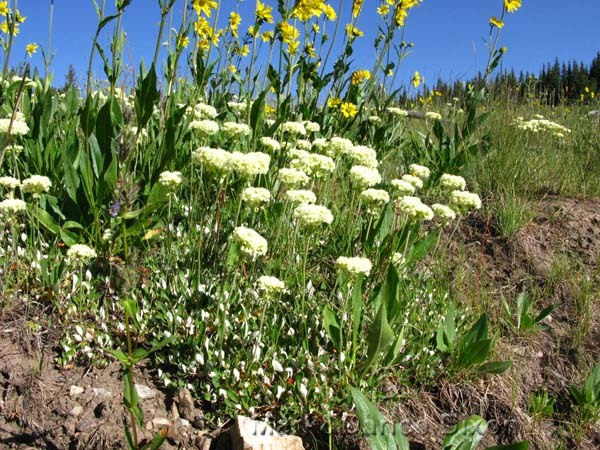 Found in the following United States: CA, CO, ID, MT, NV, OR, SD, UT, WA, WY Bloom season: July through August commonly. The photograph usually found in this frame is of the foliage of the plant. Normally the foliage appears as a very thin blade configuration looking rather like grass. Our specimens were advanced in their season with the foliage dried away to almost nothing - hence nothing to photograph. Instead enjoy the immature flower buds, delicate and pretty in pink. We were taken by surprise at these lovely pure white flowers blooming so late in the year. Never having seen this species before, we have no idea if these blooms were at their best. Sometimes late in the season we have seen flowers that looked mightly piqued. It was certainly a treat to see these, made us hungry for SPRING. 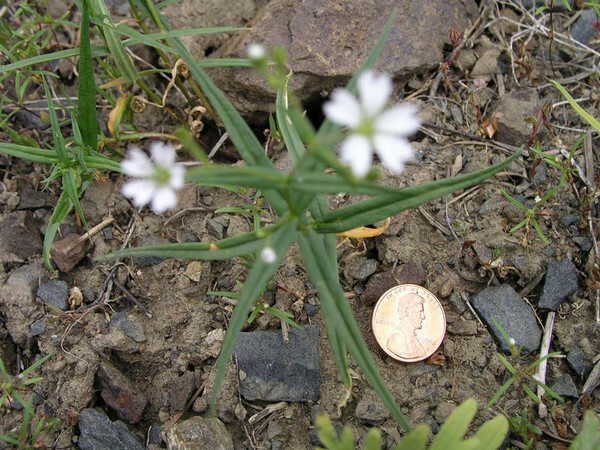 These are known to grow at low elevations. We regret that we did not note our elevation for this sighting, since it was a mountain location. There are about 300 species in this genus. Plant location: North Cascades, Washington state LATE in the season - October 2007. Bloom season: According to the book Wildflowers of the Pacific Northwest, this plant blooms all summer, but in our experience, AND THEN SOME!! One of 14 species in the genus, albus is found throughout the United States. 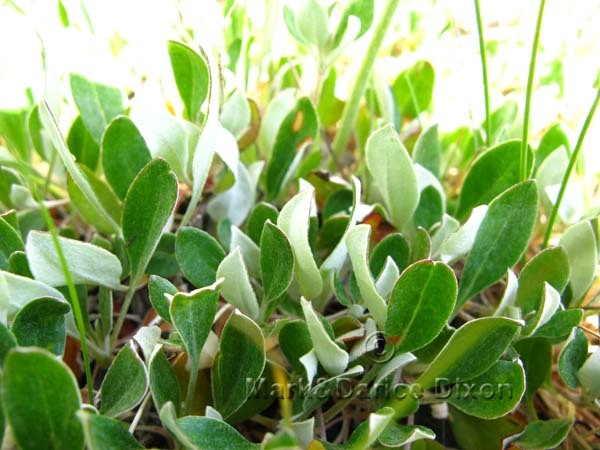 It is a perennial herb/forb with numerous medicinal and edible uses. This is a plant that has both male and female organs. USES: From Plants for a Future is this: 'Dried leaves can be toxic though the fresh leaves are quite safe. This is due to the presence of coumarin, the substance that gives some dried plants the smell of new mown hay. Taken internally it can prevent the blood from clotting. Leaves and seedpods - cooked as a 'bean soup'. The pea-like seeds are used as a seasoning for bean and split-pea soups. Young shoots - raw or cooked. Added to salads or used as a potherb. Only fresh shoots should be used the dried leaves contain coumarin. Used as a vanilla-like flavouring. An oil obtained from the seed is used in paints, varnishes etc. The dried leaves smell of new-mown hay and are used as an insect repellent. The dried leaves contain a substance called coumarin, this is an anti-clotting agent and has been used as a basis of the rat killer 'warfarin'. End quote. Plant location: Seen at the Quake Lake Visitor Center in Montana on August 28, 2009. Elevation 6705'. GPS Coordinates N44? 49.864 W111? 25.553. 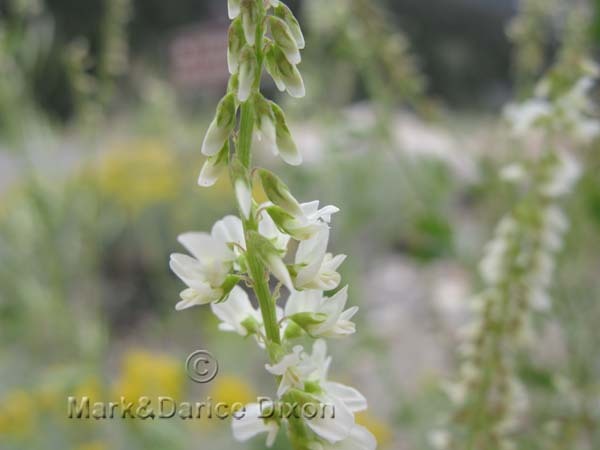 Per WIKIPEDIA is this on the habitat: 'White sweet clover is native to Europe and Asia. 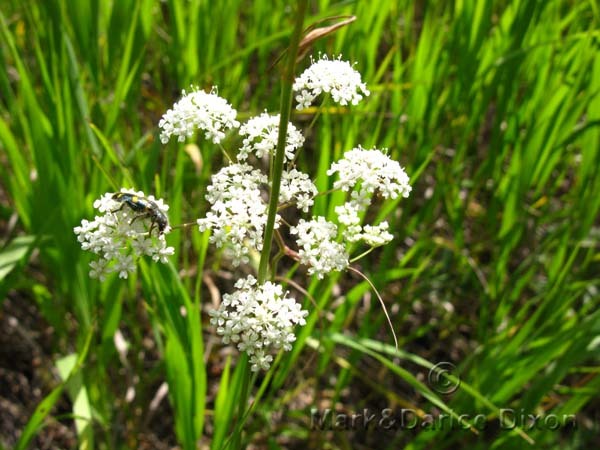 It was introduced to North America in the 1600s for cattle forage purposes and is now widespread throughout Canada and the United States, where it has become invasive and can outcompete native plant species. 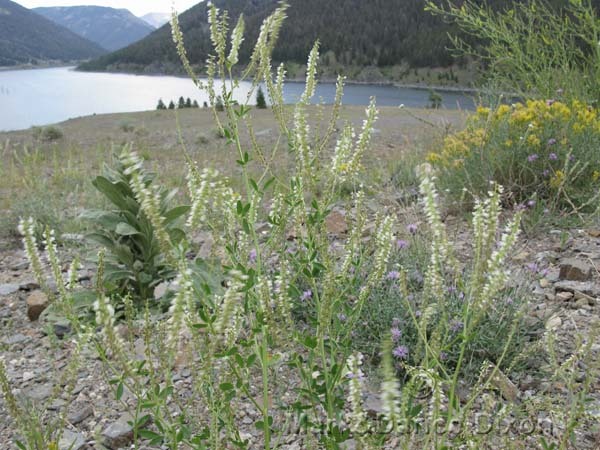 White sweet clover can grow up to 2 meters in height and can produce abundant amounts of seeds that readily float and disperse in water. This has allowed the plant to colonize natural habitat such as riparian areas all across much of North America.' End quote. Bloom season: May through October. This flower really lives up to it's name! Where do we put it, white, yellow, pink, purple? It has all those hues! There are only 26 species in this genus but our specimen has a fairly widespread distribution for wildflower lovers to enjoy. 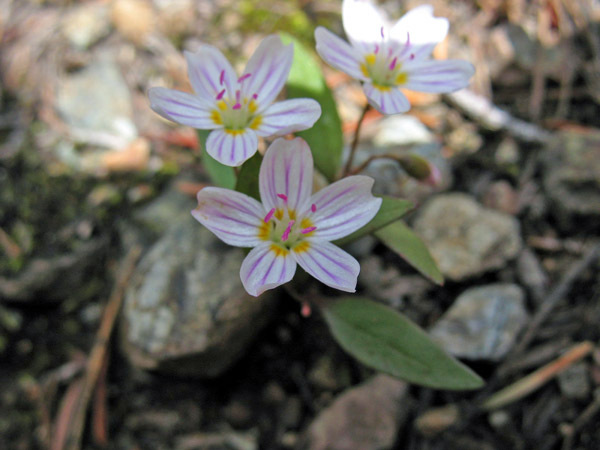 The Claytonia's are mostly North American natives, but some can be found as far away as Asia. The family group here though, is much extended with around 20 genera and 500 species. There are even members to be found in the Artic. How we wish we could sight them in ALL their locations. Plant location: Sighted on June 17, 2007 while hiking the Esmerelda Basin trail outside of Cle Elum Washington. Bloom season: April through July in mountain foothills to the high alpines. 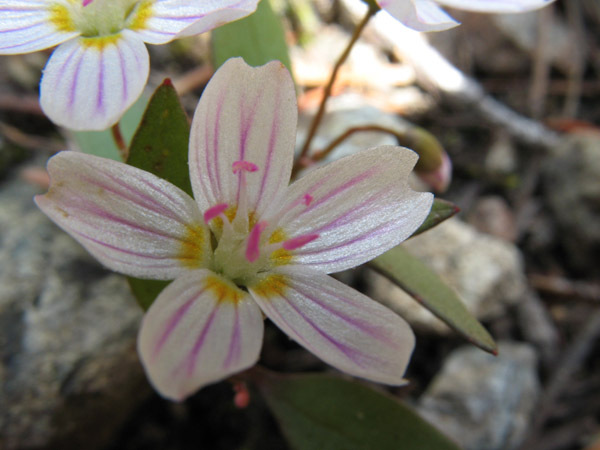 FunFact: An early explorer of Yellowstone National Park where we saw these plants was lost for over a month in the park in 1870. He is said to have survived in great part by eating the roots of Elk Thistle. USES: According to the website Native American Ethnobotany the roots of the plants were eaten raw, or pit-baked, by the Flathead, Nez Perce, and Kutenai peoples. There are 95 species in Cirsium. Plant location: Seen in the Yellowstone National Park, Wyoming, on August 28, 2009. GPS coordinates: N44? 35.775 W110? 23.248. The elevation was 7819'. The plants sprout lavendar flowers when in bloom. These had dried to brown at the time we photographed this specimen. 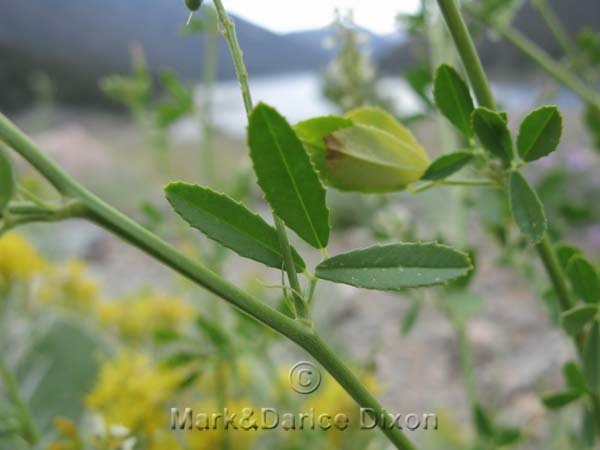 It is native to much of western North America from Canada to Mexico, where it grows in a variety of habitat types. It is recorded in the following United States: AZ, CA, CO, ID, MT, NM, NV, OR, UT, WA, WY. Bloom season: July to August. This is one of our favorite flowers from the white group. The symmetry of the white bracts against the lovely leaf structure is just so pleasing to the eyes. The bracts are actually leaf scales. 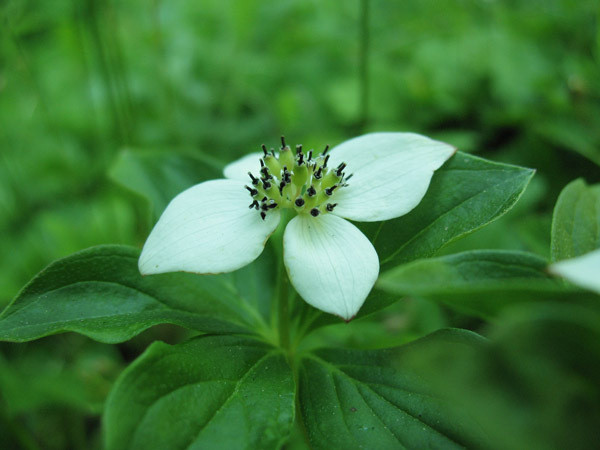 The actual flowers of the Bunchberry plant are in the center of the white bracts and look like stubby black afterthoughts! According to Dr Dee Strickler, the plant produces a fruit that he calls drupes, which look like berries but are described by him as tasteless. USES: Records of uses by Native American tribes of this species abound: Abnaki Drug (Analgesic) Decoction of whole plant taken for side pains. Algonquin, Quebec, Tete-de-Boule Infusion of leaves used as a cathartic tea. Decoction of plant and other plants used for colds. Plant mixed with other plants and used by women for stomachaches. Carrier, Southern Drug (Eye Medicine) Strong decoction of plant, without berries, used as an eyewash. Costanoan (Febrifuge) Decoction of inner bark used for fevers. Iroquois (Tuberculosis Remedy) Decoction of whole plant taken for tuberculosis. Algonquin, Quebec Berries used as a nibble food. Hoh and Quileute (Smoke Plant) Leaves dried and smoked. Berries used in ceremonies. Per the website Plants For a Future: Other uses - The fruit is rich in pectin, so is an aid in making jam, pies, puddings etc. 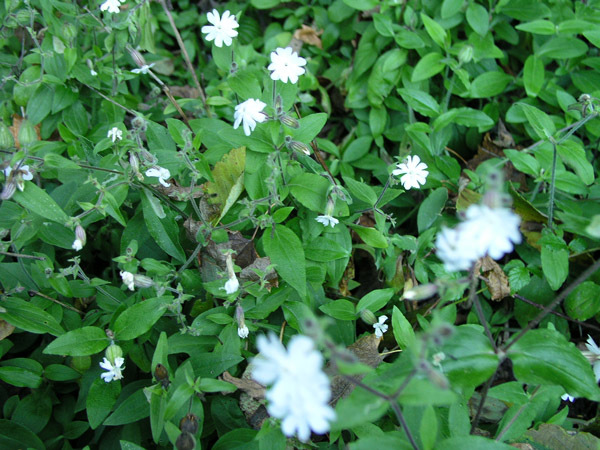 A good dense ground cover plant, growing well in light woodland. It takes a little while to settle down and needs weeding for the first few years but becomes rampant when established and can then spread 60 - 90cm ... per year! FunFact: The pollination process of this plant is extremely interesting! The following is from WIKIPEDIA: 'Each flower has highly elastic petals that flip backward and release springy filaments that are cocked underneath the petals. The filaments snap upward flinging pollen out of containers hinged to the filaments. This motion takes place in less than half a millisecond and the pollen experiences 800 times the force that the space shuttle does during liftoff. The bunchberry has one of the fastest plant actions found so far requiring a camera that takes 10,000 frames per second to catch the action' End quote. 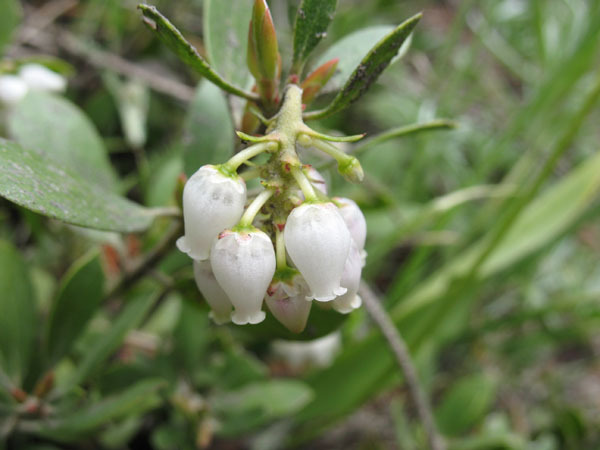 Our friend Bunchberry is not only native to North America, but also to Northern China, far eastern Russia, and Japan. 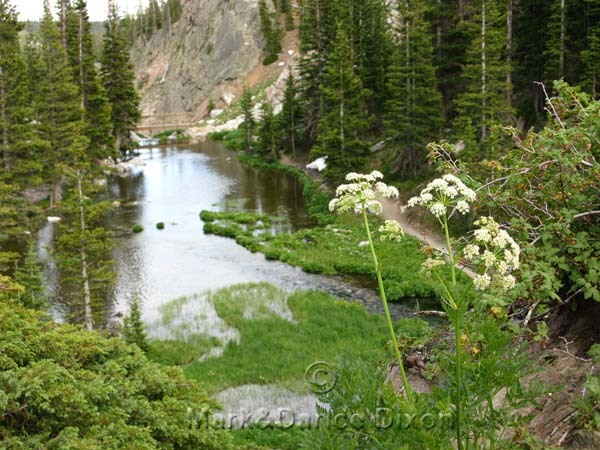 Plant location: The photos are from two sightings - Cathedral Rock in Washington state on June 25, 2005, and the Sunrise area of Mt Rainier in early July, 2007. 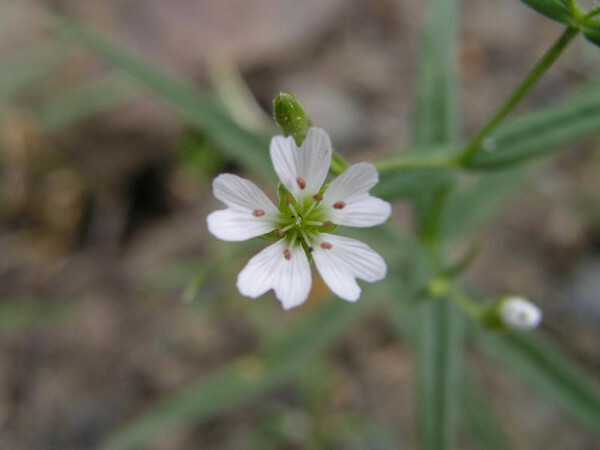 Bloom season: June and July, per Dr. Dee Strickler in Wayside Wildflowers of the Pacific Northwest. 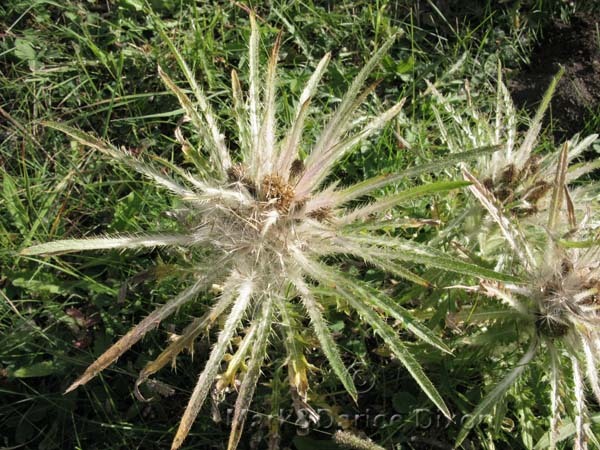 The plant is a low spreading perennial. 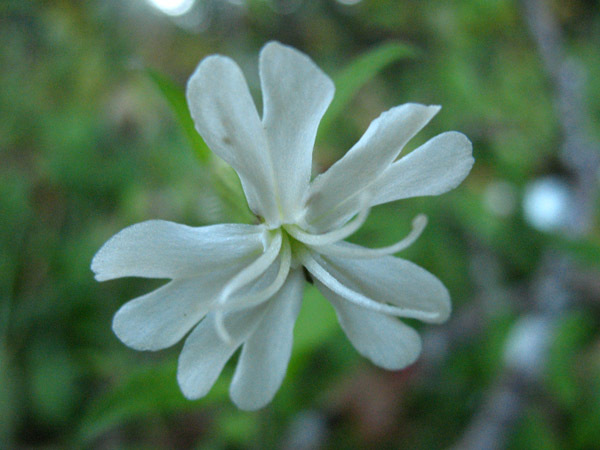 This lovely specimen is one of two subspecies of racemosa. The genus hosts 36 species total. This species is a perennial subshrub/herb and is a native to North America. 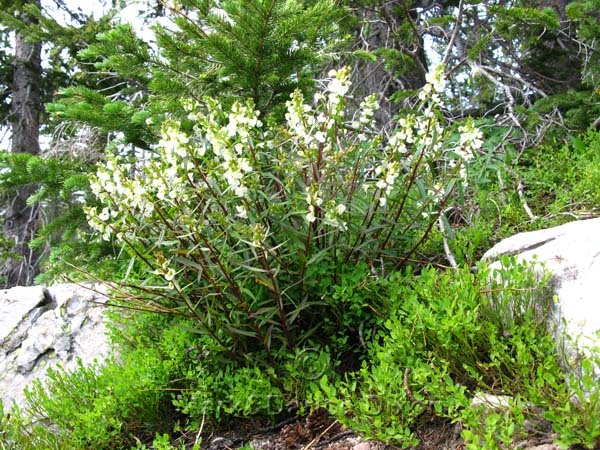 USES: The website Native American Ethnobotany has only one vague record of use: Thompson tribe - Plant used medicinally for unspecified purpose. Oddly enough: From the marvelous book by Janis Lindsey Huggins WILD AT HEART is this: 'If using Louseworts for medicine or food use caution. They can absorb toxins from nearby plants. For example, louseworts growing with Senecio species are known to contain their toxic alkaloids'. End quote. 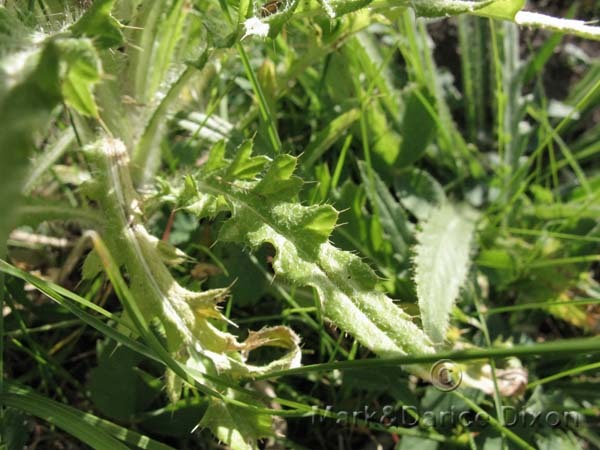 AND, while the genus name Pedicularis means 'little louse' and plants from the group were believed to give animals grazing nearby lice...hair and wigs were long ago powdered with the plant's substance to get rid of lice! Ok then! Plant location: Photographed July 22, 2009 on Hwy 130 in the Medicine Bow National Forest, Wyoming. States that host this species are AZ, CA, CO, ID, MT, NM, OR, UT, WA, WY - per the USDA Plant database. It grows in coniferous forests. Bloom season: Expect to see these lovely flowers from June to September. TOXIC: THIS PLANT IS EXTREMELY POISONOUS, especially the roots. THIS PLANT IS A KILLER. 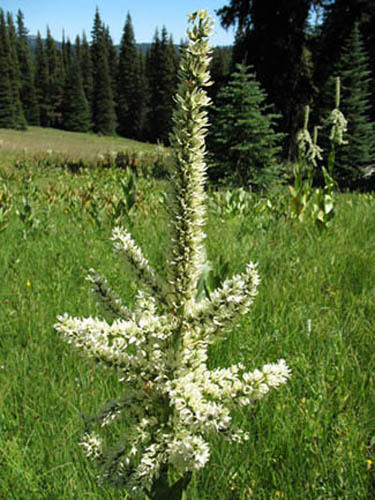 The Idaho Panhandle website has this on the plant: 'It is a tall, erect plant, all parts of which are highly toxic and potentially fatal. The highest concentration of toxins are in the roots. Early spring foliage seems to be more poisonous than mature leaves. Poisoning symptoms include burning sensations in the mouth, vomiting, diarrhea, sweating, blurred vision, hallucinations, and general paralysis. It may cause birth defects if consumed by pregnant females. The occasional cases of human poisoning have been attributed to misuse of medicinal preparations. 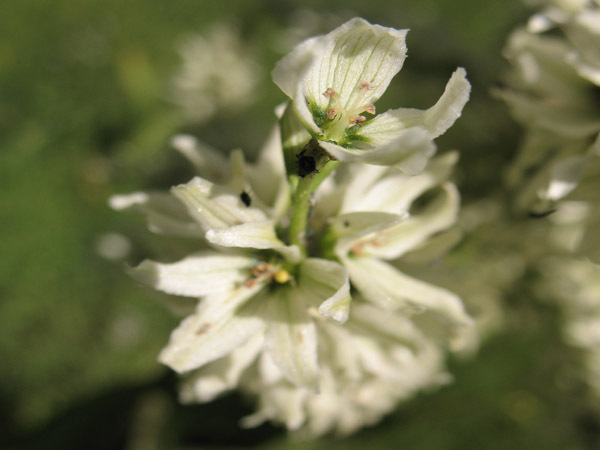 Veratrum species are used medicinally to treat high blood pressure though doses are difficult to standardize. 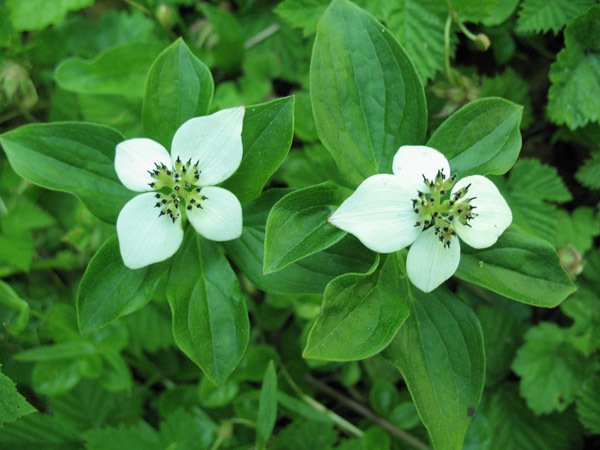 This plant was used medicinally by American Indians for external afflictions and as a local anesthetic. It was also occasionally used in cleansing rites as a purgative.' End quote. 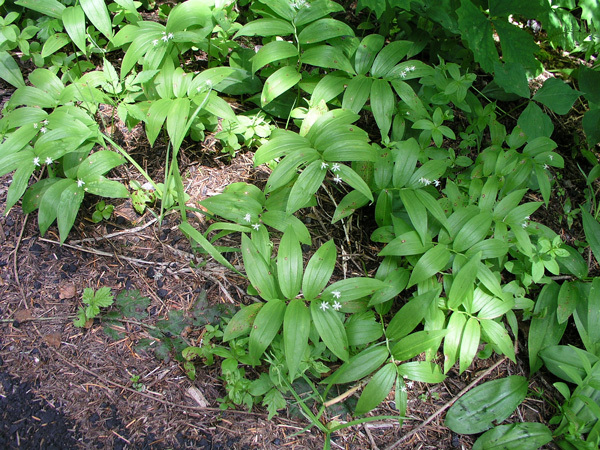 USES: From Plants For a Future: Although a very poisonous plant, California false hellebore was often employed medicinally by a number of native North American Indian tribes who used it mainly as an external application to treat wounds etc. It also had quite a reputation as a contraceptive. It is little, if at all, used in modern herbalism. Any use of this plant, especially internal use, should be carried out with great care and preferably only under the supervision of a qualified practitioner. The root is analgesic, disinfectant and febrifuge. 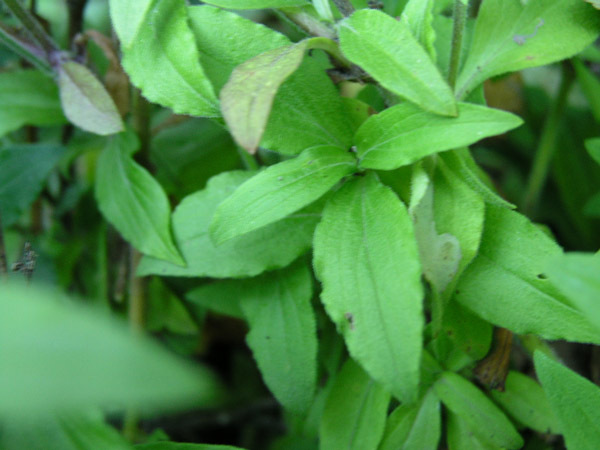 A decoction has been used in the treatment of venereal disease. The roots have been grated then chewed and the juice swallowed as a treatment for colds. 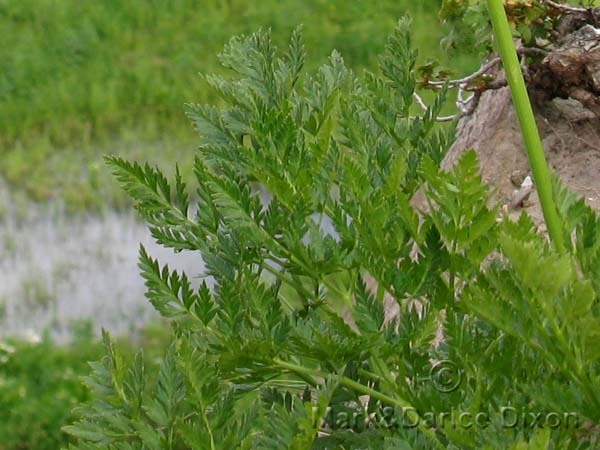 A poultice of the mashed raw root has been used as a treatment for rheumatism, boils, sores, cuts, swellings and burns. The dried and ground up root has been used as a dressing on bruises and sores. A poultice of the chewed root has been applied to rattlesnake bites to draw out the poison. The powdered root has been rubbed on the face to allay the pain of toothache. A decoction of the root has been taken orally by both men and women as a contraceptive. A dose of one teaspoon of this decoction three times a day for three weeks is said to ensure permanent sterility in women. According to the website Native American Ethnobotany, the tribes who used this species included: Paiute, Shoshoni, Thompson, Washo, Miwok, Karok, and Blackfoot (who used the pounded roots as snuff). BIZZARE birth defects can result in animals who have ingested this species: TWO-HEADED CALF Cyclopamine (a substance isolated from corn lily) was named for one-eyed lambs which were born to sheep which grazed on wild corn lily at a farm in Idaho. In 1957 the US Department of Agriculture started an eleven-year investigation which led to the identification of cyclopamine as the cause of the birth defect. Human female infant born in 2006, India, with the defect. Plant location: Mark photographed this specimen in the area of Twisp Washington, late July 2007. FOund in the following United States: AZ, CA, ID, MT, NM, NV, OR, UT, WA, WY. Bloom season: June through August. Thanks to Dr. Mary Dubler this plant has been identified! She found the specimen in the book Rocky Mountain Flora by James Ells. There are only three species in the genus Pseudostellaria. The others are sierrae (California only) and oxyphylla (only in Idaho). The family includes 88 genera and about 2,000 species. 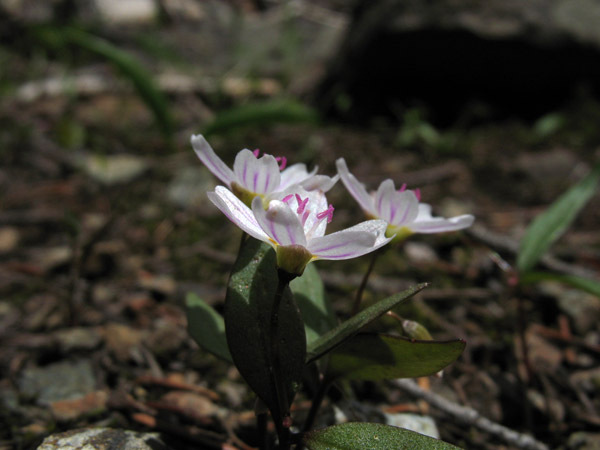 There are only 2 species in this genus, living from 1968' to 11,154' in elevation. An interesting account is found at the website Plants for a Future: 'Although no mention has been seen for this species, the leaves of some members of this genus contain saponins. Although toxic, these substances are very poorly absorbed by the body and so tend to pass through without causing harm. They are also broken down by thorough cooking. Saponins are found in many plants, including several that are often used for food, such as certain beans. FunFact: It is advisable not to eat large quantities of food that contain saponins. Saponins are much more toxic to some creatures, such as fish, and hunting tribes have traditionally put large quantities of them in streams, lakes etc in order to stupefy or kill the fish. Plant location: Seen in the Cle Elum Washington area in early June of 2007. The USDA plant database has the plant in the following states: (AZ, CA, CO, ID, MT, NM, NV, OR, TX, UT, WA, WY). Habitats include Woodland Gardens; Sunny Edge; Dappled Shade; Shady Edge; Cultivated Beds. Bloom period: Some websites mention that the seeds of the plant will germinate in early spring and bloom through summer.